To reach Surat Thani Airport from Phuket by public transport you need to take a bus from Phuket’s main long distance bus station near Phuket Town to Surat Thani City. From Surat Thani City there is a minivan service to Surat Thani Airport. The entire journey from Phuket to Surat Thani Airport takes 6 hours 20 minutes (inclusive of the 30 minute wait in Surat Thani for the next minivan to the airport). if you take the last bus of the day from Phuket to Surat Thani at 14.00 then you need to take a taxi from Surat Thani City to Surat Thani Airport as the public minivan services will have stopped running. 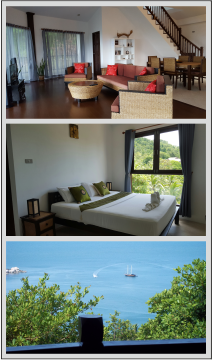 There are 4 daily direct services Phuket to Surat Thani City available to book online. Bus services to Surat Thani City depart from Phuket Bus Terminal (2). The journey time from Phuket to Surat Thani City by bus is 4 hours 30 minutes. The journey by minivan from Surat Thani City to Surat Thani Airport takes 50 minutes. Use the Search Box below to book your tickets from Phuket to Surat Thani. After booking you will be sent an electronic booking voucher which you need to print out and bring with you to the bus station in Phuket to show when you check in for the bus service 30 minutes before the scheduled departure time. Bus services to Surat Thani City depart from Phuket Bus Terminal (2) which is located 4.8 km to the North of Phuket Town. To reach Phuket Bus Terminal (2) by cheap public transport take a minivan to Phuket Bus Terminal (1). From Phuket Bus Terminal (1) take the purple songthaew shared taxi service which runs between the two bus stations. The fare on the purple songthaew service is 15 THB. There are no toilets on Phantip Bus Services from Phuket to Surat Thani, but the bus will stop once on route at a roadside service station for a short comfort break during which passengers can visit the toilet and buy food and drink. The arrival point for bus services from Phuket is the Phantip Travel Office on the Talad Mai Road in Surat Thani City Centre. Connecting minivan services to the airport also leave from the same Phantip Travel Office. Check in on arrival at the desk inside in the office for your transfer to Surat Thani Airport. The distance by road from the Phantip Travel Office to Surat Thani Airport its 27.5 km. The minivan service is scheduled to complete the journey in 50 minutes. If you need to complete the journey more quickly you take a private taxi which should get to the airport in 34 minutes. Private Taxi: Expect to pay 400 to 700 THB. The cheapest fares are offered by the small blue taxi vans which you will see running up and down the Talad Mai Road in front of the Phantip travel Office. There are also Yellow Taxis which are unlikely to agree to use their meter for the journey and will want to agree a fixed price of around 700 THB. Public Minivan: Minivan services from Surat Thani City to Surat Thani Airport are operated by the Phantip travel Company and cost 140 THB per person booked in advance online. Minivan services to the airport depart from from the Phantip Travel Office at: 06.00, 07.00, 07.30, 09.00, 11.00, 12.00, 13.00, 13.30, 15.00, 16.30, 17.30, 18.00, and 19.00. 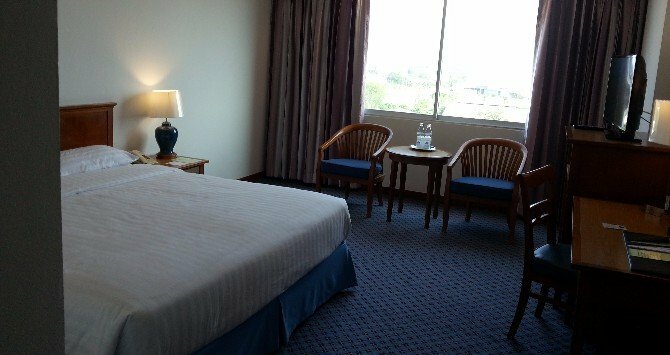 If you want somewhere really comfortable to stay overnight at affordable prices before catching a flight from Surat Thani Airport then try the Diamond Plaza Hotel which is on the road (the Sri Wichai Road) which runs from Surat Thani City Centre to the Airport.